Multilateral and Bilateral Agencies: Multilateral and bilateral agencies play a critical role in several areas, including representing the public sector and governments in our programmes, and by supporting financial sustainability, and sharing insights on water issues. Private Sector: Recognizing the importance of building a diversified base of private sector global partners, the 2030 WRG is undertaking a focused effort to engage additional private sector partners. 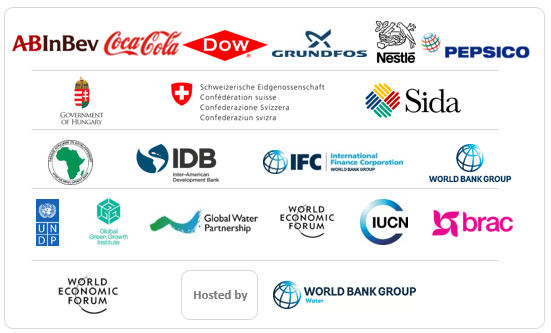 Working with its global network, and leveraging partner organizations such as IFC and the Forum, the 2030 WRG currently has a total to 6 private sector global partner companies. Cooperation with Civil Society: As a multi-stakeholder initiative, an active partnership with civil society organizations (CSOs) is a basic requirement for the 2030 WRG. This is more pronounced considering the political sensitivity of water issues in partner countries. The 2030 WRG recognizes that a more structured approach to partnering with civil society is needed.